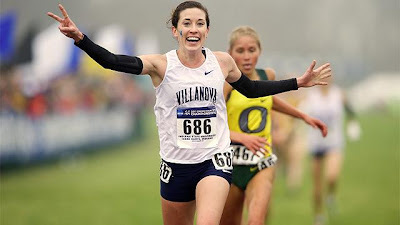 NEW ORLEANS – The U.S. Track & Field and Cross Country Coaches Association (USTFCCCA) announced on Wednesday that NCAA Division I Cross Country Champions Lawi Lalang of Arizona and Sheila Reid of Villanova were named as National Athletes of the Year for the 2011 cross country season. In addition, Wisconsin’s Mick Byrne was named the Bill Dellinger National Men’s Coach of the Year while Georgetown’s Chris Miltenberg was recognized as the Peter Tegen National Women’s Coach of the Year. Reid, a senior from Newmarket, Ontario, won her second-straight national cross country crown on Monday, leading the Wildcats to a third-place team finish. In one of the best finishes in recent memory, Reid had to compete with a lead pack of eight runners heading into the final 500-meter stretch. Reid and Oregon’s Jordan Hasay separated from the group and ran side-by-side until the final 100 meters where she out sprinted Hasay to take the crown in 19:41.2. Reid is the fifth in NCAA history to win back-to-back individual crowns. Reid also won the NCAA Mid-Atlantic title for the third-straight time this season with a 21:32.7 run to outdistance Georgetown’s Emily Infield by just over a second. Reid won the Big East crown for the third-straight time in leading the Wildcats a fourth-straight league championship.